A while back, I celebrated my 32nd birthday. I'm not a big birthday person in terms of celebrations or big get togethers. I prefer my birthday be a time for reflection, for rest and re-filling my tank, and for thinking about my next year in a meaningful way. Not the most flattering angle, but damn are we happy to be in the redwoods! As the first gift to myself, I planned a long weekend for Cam and myself up in Humboldt County. We stayed in a small studio on a farm in the college town of Arcata, and then spent our days in one of my very favorite places on earth: Prairie Creek Redwoods. The second big wish I had for my birthday was for Cam and I to sit down and look, in detail, at our personal finances. I joyfully dubbed this night "The 1st Annual Fortin Family Financial Summit." I've not written about money matters on the blog before, but my passion for minimalism has always been inextricably linked to personal finance. My journey began in 2009 with desire for more meaningful work which led me to leave my corporate job and the associated corporate paycheck (aka: I was broke). With far less cash on hand, I had to drastically increase my standards for every purchase, large or small. This meant reevaluating habits I'd picked up in high-earning days as well as more under the radar habits I'd had my entire life. In other words, it was Through Minimalism that I learned to question everything. Work until you are 65. Upgrade your phone/computer/tv as soon as you have space on your credit card. Save 5% of your annual income. Buy as big a house as your mortgage lender says you can afford. Treat yourself to luxury goods and services -- you've worked so hard, you deserve it. Buy your kids the newest toys for each birthday and holiday, that's how you show love. Constantly revamp your wardrobe, you need to keep up with the newest trends. These messages are sent to us constantly via advertising, but they're also taught to us in school and pervade most new sources. When we're constantly fed these opinions they gain the weight of fact; they seem unavoidable, inalterable. But as we all learn by living simple, gentle lives: it's not true. You get to choose your life and you get to decide how you spend your time and how you spend your money. This is a gratuitous photo of my handsome husband with a mushroom the size of his head. Let's take Retirement Calculators as an example. These are meant to be completely unbiased, strictly mathematical tools to give you a clear picture of your retirement. If you visit the websites of some of the most respected financial institutions in the US you'll find the impenetrable assumptions that total strangers have made for you. Many calculators don't let you enter a savings rate above 25%. Some give you an "error: invalid" message on living more than 40 years after you retire. My own retirement accounts are with a bank who won't let me say I want to spend less than 60% of my current income in retirement and prohibits me from entering an age younger than 50 for when I plan on retiring. And while those above assumptions seem reasonable enough, there is something maleficent lurking below the surface. When enough people begin to say something is impossible (saving 71% of your income, not producing any trash, retiring at 30) that begins to seem true. And when things seem impossible, we begin to give away our power, believing we cannot control what we own or how we spend our time or money. 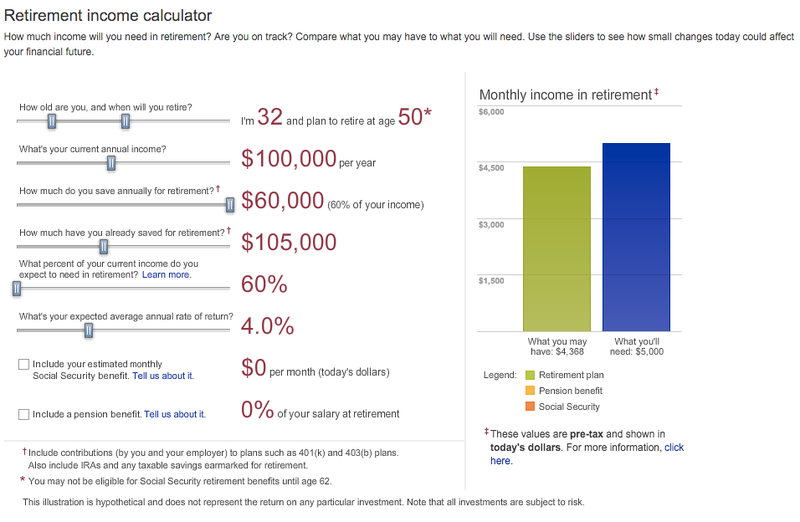 This calculator, for example, maxes out at $60,000 saved annually, no matter your level of income. It further won't let you spend less than 60% of your current income in retirement or retire earlier than 50 not matter what. The first thing Kyle and I do with our clients is get an understanding of how they most want to feel in their space and the highest values they would like their home to support. We cannot walk in and say "get rid of this plate" or "you must keep that painting" because we know that every person, family, and home is unique. After this introductory fact-finding, we assess each and every item with fresh eyes, determining whether it should stay or be donated based on how well it serves those highest values and desire. With expenses, as with stuff, the first step is to question everything. That is the strategy that Cam and I are practicing in our finances now -- starting from a place of compassionate curiosity and questioning everything that we're spending money on. Try starting from scratch without any of these limitations or beliefs. Dream up your own ideal future and then reconstruct your finances with that vision in mind. For me, the journey to personal finance devotee has been -- wait for it -- fun, joyful even. When I was making and spending a lot of money in my corporate days, I dedicated most of my waking hours to something I hated in order to buy things that meant very little to me. When I decided to leave the misery and the money of corporate work behind, for the first time I had a clean slate to determine exactly what a good budget for myself might be. As I delved into minimalism, I was constantly asking myself: "Can I live without this? ", "Does this really bring me joy? ", and "Is this something that I actively am choosing for myself or just something that I've always done?" This line of questioning can be applied to anything: habits, relationships, stuff, spending, all of it. Moral of the story: Question Everything. Lastly, a huge congratulations to Joshua Becker of Becoming Minimalist on his new book The More of Less. We pre-ordered this book a while ago, knowing it would become a crucial part of our own micro-library. We wholeheartedly recommend to anyone looking for both inspiration and compassion on their journey to becoming a minimalist!